How can you improve your guitar playing most quickly? ...By learning how to solve guitar playing problems when you practice. The key to solving your guitar playing problems is making your guitar pactice as effective as possible. Mindlessly repeating exercises gets you nowhere (even if you practice guitar for 8 hours per day). Correct guitar practice is about using your brain as much as you use your hands. Your brain tells your hands what to do to make your guitar playing improve... then your hands do it and develop the right habits that make your playing better. When you struggle to play something on guitar, isolate the exact notes that give you trouble. Focusing on the source of your guitar playing problems makes your practicing more productive. Watch the video above (starting at 0:58) to see an example of how to correctly isolate your guitar practice problems. This helps you avoid wasting practice time on things you can play well. After you have isolated the problem, magnify it to make it easier to fix. Watch the video starting at 4:01 to see how to magnify a problem. The example you see is about magnifying a 2-hand synchronization challenge. Repeat the hard part several times (this is the approach I demonstrated in the video). Play the hard part on the lower frets. Play the hard part with all downstrokes or all upstrokes. Play the hard part on an unplugged guitar (when the problem is related to articulation or 2-hand synchronization). Play the hard part with more distortion or at a louder volume (when the problem is related to string noise or sloppy guitar playing). Keeping your hands in perfect sync, so that every note you play is clearly heard. Muting excess string noise that causes sloppy guitar playing. Making the motions very efficient in both hands (WITHOUT sacrificing power). Minimizing excessive tension in your body that makes playing guitar hard. Your brain must be engaged 100% of the time while you practice. Practice at a speed that is challenging for your hands, but slow enough for your brain to process every note. This is how you develop flawless guitar technique. 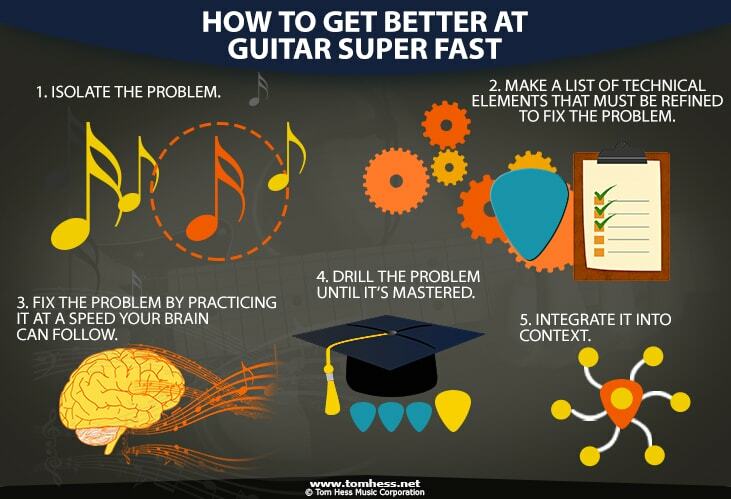 Practicing faster than you brain can follow makes it very hard to improve your guitar playing. Watch the video starting at 3:16 to see what it means to practice guitar without your hands outrunning you brain. This guitar speed guide helps you master this element of effective guitar practice. You must repeat the problem area enough times to master it. How many times is “enough”? This is one of the more dangerous questions guitar players often ask. Following this process makes you a better guitarist with every repetition of your exercise. Integrate the isolated part into the original guitar lick or song (after it is mastered). Add notes before and after the segment to incorporate it into the rest of the phrase. Example below illustrates an isolated excerpt from a scale run (shown in red). To extend the excerpt, add notes in blue (one at a time) to it until you are playing the entire phrase. Use this practice approach to solve your guitar playing problems and speed up your musical progress. To master your guitar technique and speed, download this free guitar speed guide. Learn how to become a great guitarist fast by taking online rock guitar classes.